It was before your eyes that Jesus Christ was publicly portrayed as crucified. Let me ask you only this: Did you receive the Spirit by works of the law or by hearing with faith? Are you so foolish? Having begun by the Spirit, are you now being perfected by the flesh? Did you suffer so many things in vain—if indeed it was in vain? Does he who supplies the Spirit to you and works miracles among you do so by works of the law, or by hearing with faith—just as Abraham “believed God, and it was counted to him as righteousness”? In Dawning Realm (IC XC NIKA), David R. Bickel announces the good news of the kingdom of God as confessed at Caesarea Philippi, Nicea, and Augsburg. The Greek IC XC NIKA means Jesus Christ conquers. “I decided to know nothing among you except Jesus Christ and him crucified” (1 Cor. 2:2). The achives of Dawning Realm are organized by category. 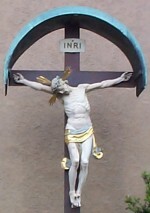 Entries in the † Theology † category pertain to teachings of the Christian faith, the theology of the crucified Christ. These posts are best accessed by clicking the tags on the sidebar. The Augsburg Aggregator (discontinued 1 November 2010) provided convenient access to recent weblog entries by authors who adhere to the Augsburg Confession. Member blogs were supported by Crux Sola, a confessional Lutheran search engine. Each site appeals to a different audience.